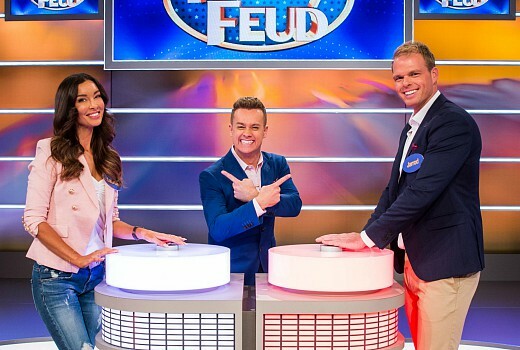 Grant Denyer has now confirmed production is ending on Family Feud, as revealed by TV Tonight. “In total we have done 1,200 episodes,” he said today on 2DAY FM. “I have said Survey Says 30,000 times. “Look, it’s been a huge success for TEN. It has re-invigorated that 6pm slot for Channel TEN. Denyer says he is in discussions for other projects with TEN. “One of the reasons why they’re resting it is they want me to do some big new projects and they can’t do both,” he said. TEN and FremantleMedia did not respond to earlier enquiries. On Facebook, TEN still says Feud is ‘Resting’.So what’s to believe? Survey says … it’s about time. Why didn’t TEN just put it on at five or 5.30 instead, it’s silly if you ask me. It’ll always be a great show. Just read a funny comment. It’s being axed because TEN couldn’t find 100 viewers to survey. It’s a shame. My friends and I play “most inappropriate answer” Feud in our house – always amusing!! I always spare a thought and get a little upset for a lot of the behind the scenes staff who are now out of a job when these shows cease operations. Surely there are other presenters. Pointless in format is actually essentially the opposite of Family Feud, trying to find the lowest polled answers rather than the highest. Will have to be reworked quite significantly though to fit a 30 minute slot with commercials – that’s half it’s running time on the BBC, but could probably be done with just three teams and tighter editing. There is also a different feel to the show. The two British hosts are understated and the humour subtle, so Grant would need to learn to tone it down, and they would need a very, very good offsider. A shame but I’m not gonna miss it that much. I used to archive old shows and other items I liked from TV on video and DVD and I stumbled across bits of a show titled Bert’s Family Feud on a DVD from 2008 hosted by Bert Newton. It was on Nine at 5:30 weekdays before they began Eddie’s Hot Seat. I had completely forgotten about this show. How many episodes of it were made, more or less than Grant’s version? 2 seasons. Wiki says 280. I’m tipping Denyer will re-appear as host for the local version of Pointless being made for TEN. I’m thinking Studio 10 until they ‘rest’ that too. Very sad that Family Feud has been axed. Loved the show and I loved Grant as host. I hope it can be brought back at some point, but I’ll be interested to see what Grant hosts next. Considering there were over a thousand episodes made I suspect Family Feud will keep appearing fairly regularly in the future, probably during the early afternoon and during the non-ratings holiday periods. 7Two and 7flix strip re-runs of Deal or No Deal/Million Dollar Minute/Go Go Stop/It’s Academic during early hours or morning and afternoon. Well, it screened 5 nights a week and simulcast on 3 stations. It waa milked to death. Broughy now reads Channel 7 Queensland local news, based at Maroochydore. He still has the hair, albeit toned down somewhat. Well let’s hope these new projects might come out of Melbourne. You can’t run an industry purely out of Sydney. I always found the way Grant interacted with the contestants to often by condescending. It’s a good family game show, I think they should keep it. Maybe put it at 5 and then the news from 5:30-6:30 then the project? I upset TEN when I wrote a post on the show’s announcement that it was a drab idea. But I later acknowledged to producer Pam Barnes that the show was working because it looked like Grant was having fun, which he never appeared to do with Million Dollar Minute. That said, I was never a fan of the roadblock simulcast. News releases all say Family Feud “will not return”. It was on last night, so return from where? In 2019 after summer break? Or sooner, like this weekend? Very vague announcement. TEN could of waited to see if it would’ve grew during Master Chef! Sad. I liked what Grant brought to the show. I hope his next endeavors bring out the fun in him also. Agree, prob a bit too much, though our family like to watch [probably once a week]. And it finishes just after they built that brand new set. Wonder if someone like Kramer will snap it up and put it in their house!!! !